Houston, Texas- On May, 4th 2017 Flame Seal Products took part in the 9th Annual AACC Energy and Technology Conference. The purpose of this conference was to bring together U.S. and Australian executives to discuss collaboration, innovation, and technologies. The conference was highlighted by several influencers and industry leaders in the Energy and Technology fields, including speakers from IBM, BHP Billiton, Nasa, and much more. Flame Seal Products exhibited at the conference and featured their line of innovative wildfire products. Perimeter Guard (PG™) is a proprietary powder designed for dilution in water and applied as a passive fire retardant to the natural areas surrounding the perimeter of homes and other landscaped areas during the threat of a wildfire. The product is applied directly to the natural areas around the perimeter of your home or facility. 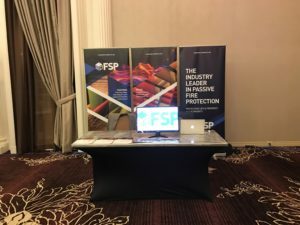 In combination with PG, Flame Seal exhibited their structural intumescent coating called FX-WF™. WF is designed to be applied up to several days, depending upon conditions before the arrival of a fire. On exposure to fire, FX-WF™ produces thick intumescent foam, which acts as a heat and fire barrier, protecting the underlying structure. The coating “swells up” nearly 100 times in thickness when the heat of the wildfire approaches, therefore protecting and insulating the structure from the fire.